I love summer rolls. The cold chewy texture of rice paper wrapped around a little package of refreshing flavors is so fun to eat and pleasing to the palate. There are endless combinations and the fun is in creating rolls that match your tastes. I was inspired to make these vegetable rolls after I enjoyed my friend Meghan's version. They make such an impressive presentation when using vibrantly colored vegetables. I used the vegetables that I had in my refrigerator and I also took the liberty of adding some tempeh that I sauteed in olive oil. The process for making these is very straight forward – once all of the ingredients are prepped it's just a matter of assembly. One tip that Meghan shared with me is wrapping each roll twice with the rice paper. This makes for a chewier roll that stays wrapped more readily. The dipping sauce that I used was my all-purpose peanut sauce but you can use whatever dipping sauce that you like. Feel free to experiment with your favorite fillers too! 1) Begin by cutting the tempeh into small cubes. Heat a sautee pan over medium heat and add a tablespoon or two of olive oil. When the pan is hot (I sometimes just flick a little water on the pan and when I hear a sizzle I know it's hot) add the tempeh and stir regularly to lightly brown all the sides. Once the cubes of tempeh are lightly golden set aside on a plate to cool to room temperature. 2) For the vermicelli rice noodles just follow the instructions on the box – typically you just soak them in hot/warm water until they transform into delicate limp strands. Set aside. 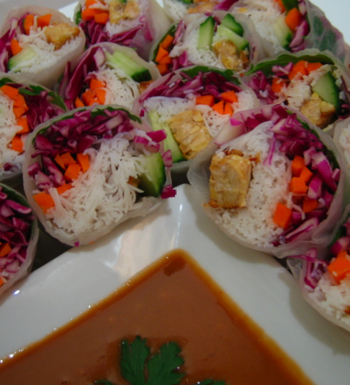 3) Meanwhile – prepare all of the vegetables that you'd like to include in your summer roll. I used: purple cabbage (added great color), carrots, and cucumber. For the cabbage just remove the outer most leaves and cut the head in half – then when its rested firmly on a flat surface cut thin slices to produce the shredded cabbage effect – use a quarter of a head of cabbage (chop some more if needed). For the carrots and cucumber I just cut them into long thin strips. I washed the cilantro and left a bunch of it along with the prepped veggies. Once everything has been prepped it's time to assemble the rolls. 4) Prepare a shallow baking dish with warm/hot water for dipping the dry rice paper sheets. The rice paper, as you'll discover, comes packaged in dry and brittle sheets and you'll need to dip it into very warm water for a few seconds to allow it to soften and become malleable. You'll do this dipping step only when you're ready to assemble the rolls and you'll want to do each one individually. Take a piece of rice paper, dip it in the warm water until it's softened enough to work with, place it on a clean flat surface, place a few leaves of cilantro along the bottom, add some cabbage on top then the carrots, cucumber, and tempeh – all in a narrow row along the bottom part of the rice paper. Finally add the vermicelli rice noodles. Now for the rolling part, you basically want to wrap it as you would a burrito. There is more than one way to do this but to help guide you I found a great site that explains this very well. This part can be a little tricky but after a roll or two you'll get the hang of it. As you get used to rolling you'll also find out the best way to layer ingredients so that they look nice through the translucent rice paper (which is why I recommended starting with the cilantro but you may find a preferable arrangement once you try a few rolls). Now that you have your little roll – take another sheet of rice paper – soften it in the warm water and then re-roll your original roll so that it's double-wrapped. This extra step really helps the rolls stay together and also adds more of that great chewy texture I find so enjoyable in summer rolls. When all of your rolls are done I either leave them in the fridge or on the counter well wrapped for about 20 minutes before serving – this gives them time to slightly firm up and they'll hold together better when you cut them. 1) Mix all the ingredients together except for the water – I recommend adding the water slowly at the end so that you can control for how viscous you'd like your sauce to be – (because this sauce is so flavorful you can add quite a bit without compromising taste). As you'll see, the peanut butter "melts" when you start stirring it with the soy sauce and other ingredients. Stir very well until everything is combined. Yours look so much more professional than mine… but equally delicious! Aren’t these incredible. They are so good and just about anything goes in them, ha even peanut butter. I was so afraid to try them and then had to laugh when it worked so well. These look lush!! G — The pic of the spring rolls looks simply amazing! I love the crisp taste of the veggies you selected. Does the sauteed tempeh have a flavor, or does it rely on the flavors from the veggies and the peanut sauce? I love purple cabbage so much. These look delicious. Your photography is fabulous! So vibrant. I need to make these…so healthy and pretty. The Microplane is my life. Feel better! Just thought I’d tell you, I tried making the peanut dipping sauce last night and it was BRILLIANT! 4 tablespoons of water made for the perfect consistency. Needless to say we wolfed it all down right there and then. Glad the cooking is going well. Aren’t these rolls the best? I love the mix of textures and the cool feel of them. Fantastic for outside snacks in the sun.